On this episode of Animation Damnation, the gang tackles the heavily requested, Cartoon All-Stars to the Rescue! How much weed does this kid think he needs? Why did the President and First Lady introduce this thing? And how many kids were actually turned on to drugs by this? PLUS: Why only one Teenage Mutant Ninja Turtle? Cartoon All-Stars to the Rescue stars a ton of voice actors who do everything else and it was directed by Milton Gray, Marsh Lamore, Bob Shellhorn, Mike Svayko and Karen Peterson. Yes, five people directed this thiry-minute cartoon. Be sure to check out other episodes of Animation Damnation and our other bonus shows by picking up our app or visiting our Bandcamp page! 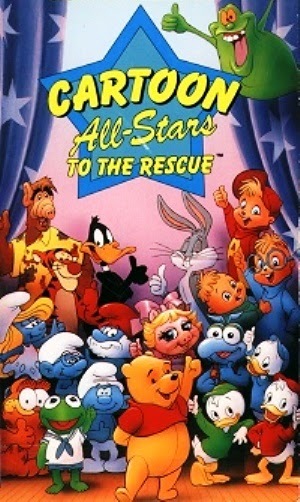 The irony of "Cartoon All-Stars To The Rescue is that we would not be talking about it had it never got a VHS release at all after it's fated first airing. That tape technically was available only to video stores who stuck it in the rack usually designated to "Free/Educational/Instructional" videos (the cover itself even made it clear this was a free rental). Aside from the few networks mentioned, the special was opened to any broadcaster who may have wanted to show some commitment to drug prevention (if ever). This TV Guide clipping indicates even PBS stations ran it alongside such cable TV luminaries as Nickelodeon, BET and USA Network. Even the CBC in Canada played it too. The bit with the dad finding beers missing in the fridge always stuck out as rather odd in my head, though no doubt they wanted so badly to suggest the kid was going to get into that stuff as well as crack and whatever else along the way (no mention of Crystal Meth in sight). and this is really the only time we ever see Michael's parents at all and never again, though I think the daughter does get a talk from the dad in the garage in one scene, not important since she bothers to lie about it. I miss that late 80's mod fashions such as the chick Michael hangs with at the arcade (the typical seedy underbelly of prepubescent hijinks). So where does your immediate future of merely a time-keeping device as a wrist see lie ahead during this transforming position? The answer is usually found by just affirming into the view that timepieces were replica louis vuitton handbags possibly not solely time-keeping tools, but also a better way of fashioning. This component becomes very clear if an individual looked included in the world for today's fashionable watch portion. In inescapable cheap replica watches fact, there happen to be no simpler timepieces you can purchase anymore. Only types of fashionable watches together with their lookalikes happen fake watches to be what one should expect Swiss Replica Watches to encounter in any arena for watch industry fake Breitling watches as of late.